other things amanzi: crimes against humanity? recently i read a post that really touched me. it got me thinking a bit about the recent suggestion to charge mbeki with genocide because of the fact that his denialist policy has resulted in so many hiv related deaths. politicians always amaze me. the story in the post is not unique in south africa. truth be told, those children actually have it quite good. they have someone who loves them looking after them and that someone is on antiretrovirals, so she should be around to bring them up. there are many more aids orfans in a much worse situation. there are also thousands of children infected with the virus today as a direct result of the mbeki regime. now i'm but a lowly surgeon. i can't see the big picture. my mind gets stuck with the individuals. i'm touched by the plight of these children and i'm shocked that mbeki washes his hands of them. when blinded as i am by the suffering of these little ones, i just can't seem to appreciate the important effects of mbeki's decisions, like his career and the anc maintaining a façade of having things under control. somehow the little people are more important to me than all those anc fat cats. interesting to note julius malema's reasons for not pursuing the charge of genocide against mbeki. he says they should not charge one of their own. i just wonder, why are those innocent children not one of their own too? 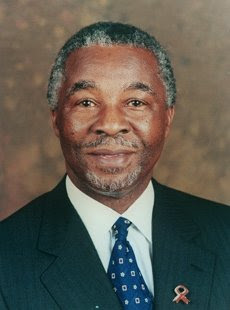 is one man, mbeki, more important than thousands of lives and the devastated lives of all these children? a good anc answer would no doubt be most definitely! but somehow i have my lingering doubts. as usual the anc takes no responsibility and the people that suffer are the innocent. maybe not genocide, but what about charging mbeki with crimes against humanity?